Using Cricut Apps to Design Sewing Projects - Sew What, Alicia? The Cricut apps are such a great tool for using your phone or tablet to create fun sewing projects. This post will take you through several fun aspects of the app to create your own sewing project. How do I use my own images on Cricut? Being able to use your own designs is one of the best parts of the Cricut App. For this tutorial I am using a drawing that my son created. He got a serious kick out of me and using his picture! This image is not great for using as a cut file, it would be great to use as a print then cut for stickers or on printable vinyl. Open the app. Then click upload. Next pick if you want to take a photo or use an image that is already on your phone or tablet. To take a photo of a drawing click take a photo. If you want to use an existing iCloud file click browse files. If you want to use a photo from your photo library click select from photo library. The last option “open uploaded images” will let you use the images you have uploaded to your design space account. So if you have uploaded it on your computer or the app previously you can find the file in this selection. How do I upload images to the Cricut app? Once you have picked one of the selections above you will need to follow a few more steps to upload an image. If you select the take a photo option you will want to make sure and use a well lit space. The image should be as cleaned up as possible before you take the photo. This will save you some extra work down the line. Snap your photo. Now we will use the tools to clean up the image. Click the remove tool and click somewhere in the background. Your image may need more editing. You can play with each tool to see what it does. After you hit remove you will see a slider that allows you to remove more or less of the background. If you have spots that you want to erase you can click the erase tool to remove those. The next option will allow you to remove any speckling. Again you will use the slider to remove more or less. You will also see at the bottom the smooth tool. This again works on a slider and will help smooth out any jagged lines in your image. Jagged lines will not cut well so you should get rid of them. Once your image is cleaned up you can save the image as a cut or print then cut. As I said above this image is not great for cutting. It would work great as a print then cut. Once you have saved the image you will be able to add it onto your design screen. Here you can resize it, flip it, spin it around. You can do anything on this screen that you can do on the standard design space on your computer. SnapMat is a fantastic feature for those of us who use the Cricut Maker for sewing. SnapMat is basically fussy cutting with the Cricut. You will take a picture of your cutting mat with the fabric placed on the mat. Then you can move your image around so that it cuts on the part of the fabric that you choose. SnapMat is also great if you are trying to use scraps. Take a picture of the mat with your vinyl or fabric scraps placed and then you can manipulate the images so that they fit over the scraps. To use SnapMat first pick your image and when your image is ready click Make it. Next follow the instructions on the screen to take a photo of the mat. (Can I tell you how hard it is to take a photo and get the grid lines to line up??) If you aren’t happy with the shot you can retake it, or use the photo and move to the next step. Now you can move your image around so it lines up exactly where you want it to on the fabric. **Note: I had trouble getting the image to move if I hadn’t selected it before I snapped the SnapMat image. I went back and selected the image and moved it around the mat before snapping the SnapMat image and then it let me manipulate it after the mat had been snapped. Here is a quick video showing a few of the editing techniques you can do using the Cricut Apps. **I forgot to mention in the video that you can pinch with both fingers to zoom in or out on your canvas (on the iPhone) so keep that in mind when watching the video! **To select multiple shapes drag your finger across the shapes (or words) and then release once you have them selected. Last hit continue and sync your phone to your machine and cut! 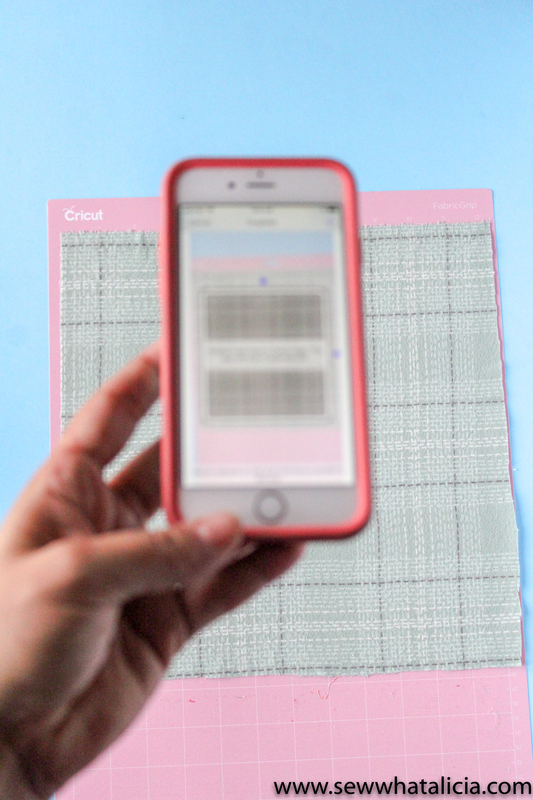 For more great tips check out this post about the Cricut App. And for tips on Design Space itself look here. Do you have more questions about the Cricut apps? Share with me in the comments below.